UK’s minister for Africa Mark Simmons said Tuesday that his government was committed to helping Somalia organize public presidential polls by 2016. Talking to reporters at the Presidential Palace in Mogadishu after meeting with Somali President Hassan Sheik Mahmoud, the British Minister for Africa Mr. Mark Simmons said that his government was giving top priority to get Somalia stand on its feet once again. “Britain is one of the frontrunner international community members in the search for peace and stability in Somalia” the visiting UK minister said, adding that for the past two years his government organized international meetings on Somalia whose main aim was to turn the world’s attention onto Somalia. He said that Britain’s efforts lead the rest of international community to organize the Yokohama and Brussels conferences on Somalia which he said had all yielded positive results for Somalia’s reconstruction. 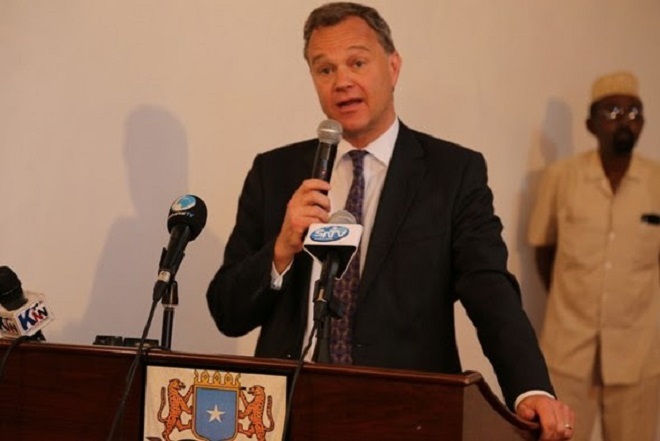 “Britain is vowing to support Somalia in different ways and in particularly we will support Somali National army and police forces to help them promote security and stability in the country” UK’s minister for Africa Mark Simmons noted. President Hassan Sheik Mahmoud of Somalia thanked the UK government for all efforts toward the introducing of peace and stability into his war-weary country. The president outlined the visiting British minister on his government’s plans for the restoration of peace and security. “Somali government has given the first priority to security, stabilisation, revising the constitution, the implementation of the federal system and as well as democracy” said president Hassan Sheik Mahmoud noted, vowing that his government will work harder to realise its commitment of holding public presidential polls in the country by the year 2016. The president noted that the AMISOM and Somali forces were smoothly conducting security operations which are intended to oust the Al-Qaeda-linked Al Shabab militants from regions they were still controlling. “We hope from Britain to play an active role in the national stabilization program so that the Somali government will be able to form interim administrations in the freed regions and send assistance to the vulnerable people living in those regions” President Hassan Sheik Mahmoud told the visiting British minister during their meeting at the presidential palace on Tuesday. President Hassan was accompanied in the meeting by the minister of Justice and constitution Farah Sheik Abdulkader, the minister of defence Mohamed Sheik Hassan, the minister of Interior and federalism Abdullahi Godah Barre and internal security minister Abdikarim Hussein Guled. Posted on 15th April 2014 by newsafrica. This entry was posted in Africa, African Security, Al Shabab, Islam, Religion, Somalia, United Kingdom and tagged Africa, African Union Mission to Somalia, Al-Shabaab, Federal Government of Somalia, Hassan Sheik Mahmoud, Mogadishu, President of the United States, Somalia. Bookmark the permalink.